Docking and berthing of spacecraft is the joining of two space vehicles. This connection can be temporary, or semipermanent such as for space station modules. Docking specifically refers to joining of two separate free-flying space vehicles. Berthing refers to mating operations where an inactive module/vehicle is placed into the mating interface of another space vehicle by using a robotic arm. Because the modern process of un-berthing is manually laborious, berthing operations are seen as unsuited for rapid crew evacuations in the event of an emergency. A docking/berthing connection is referred to as either "soft" or "hard". Typically, a spacecraft first initiates a soft dock by making contact and latching its docking connector with that of the target vehicle. Once the soft connection is secured, if both spacecraft are pressurized, they may proceed to a hard dock where the docking mechanisms form an airtight seal, enabling interior hatches to be safely opened so that crew and cargo can be transferred. The first spacecraft docking was performed between Gemini 8 and an uncrewed Agena Target Vehicle on March 16, 1966. Spacecraft docking capability depends on space rendezvous, the ability of two spacecraft to find each other and station-keep in the same orbit. This was first developed by the United States for Project Gemini. It was planned for the crew of Gemini 6 to rendezvous and manually dock under the command of Wally Schirra, with an uncrewed Agena Target Vehicle in October 1965, but the Agena vehicle exploded during launch. On the revised mission Gemini 6A, Schirra successfully performed a rendezvous in December 1965 with the manned Gemini 7, approaching to within one foot, but there was no docking capability between two Gemini spacecraft. The first docking with an Agena was successfully performed under the command of Neil Armstrong on Gemini 8 on March 16, 1966. Manual dockings were performed on three subsequent Gemini missions in 1966. The Apollo program depended on lunar orbit rendezvous to achieve its objective of landing men on the Moon. This required first a transposition, docking, and extraction maneuver between the Apollo Command/Service Module (CSM) mother spacecraft and the Lunar Module (LM) landing spacecraft, shortly after both craft were sent out of Earth orbit on a path to the Moon. Then after completing the lunar landing mission, two astronauts in the LM had to rendezvous and dock with the CSM in lunar orbit, in order to be able to return to Earth. The spacecraft were designed to permit intra-vehicular crew transfer through a tunnel between the nose of the Command Module and the roof of the Lunar Module. These maneuvers were first demonstrated in low Earth orbit on March 7, 1969, on Apollo 9, then in lunar orbit in May 1969 on Apollo 10, then in six lunar landing missions. Unlike the United States, which used manual piloted docking throughout the Apollo, Skylab, and Space Shuttle programs, the Soviet Union employed automated docking systems from the beginning of its docking attempts. The first such system, Igla, was successfully tested on October 30, 1967 when the two uncrewed Soyuz test vehicles Kosmos 186 and Kosmos 188 docked automatically in orbit. This was the first successful Soviet docking. Proceeding to manned docking attempts, the Soviet Union first achieved rendezvous of Soyuz 3 with the uncrewed Soyuz 2 craft on October 25, 1968; docking was unsuccessfully attempted. The first manned Soviet docking was achieved on January 16, 1969, between Soyuz 4 and Soyuz 5. This early version of the Soyuz spacecraft had no internal transfer tunnel, but two cosmonauts performed an extravehicular transfer from Soyuz 5 to Soyuz 4, landing in a different spacecraft than they had launched in. In the 1970s, the Soviet Union upgraded the Soyuz spacecraft to add an internal transfer tunnel and used it to transport cosmonauts during the Salyut space station program with the first successful space station visit beginning on 7 June 1971, when Soyuz 11 docked to Salyut 1. The United States followed suit, docking its Apollo spacecraft to the Skylab space station in May 1973. In July 1975, the two nations cooperated in the Apollo-Soyuz Test Project, docking an Apollo spacecraft with a Soyuz using a specially designed docking module to accommodate the different docking systems and spacecraft atmospheres. Beginning with Salyut 6 in 1978, the Soviet Union began using the uncrewed Progress cargo spacecraft to resupply its space stations in low earth orbit, greatly extending the length of crew stays. As an uncrewed spacecraft, Progress rendezvoused and docked with the space stations entirely automatically. In 1986, the Igla docking system was replaced with the updated Kurs system on Soyuz spacecraft. Progress spacecraft received the same upgrade several years later. :7 The Kurs system is still used to dock to the Russian Orbital Segment of the ISS today. Flight Support Structure in Columbia's payload bay under the 180 degree mark on the -V3 plane of the Hubble Space Telescope during STS-109. Berthing of spacecraft can be traced at least as far back as the berthing of payloads into the Space Shuttle payload bay. Such payloads could be either free-flying spacecraft captured for maintenance/return, or payloads temporarily exposed to the space environment at the end of the Remote Manipulator System. Several different berthing mechanisms were used during the Space Shuttle era. Some of them were features of the Payload Bay (e.g., the Payload Retention Latch Assembly), while others were airborne support equipment (e.g, the Flight Support Structure used for HST servicing missions). Look up androgynous in Wiktionary, the free dictionary. Docking/berthing systems may be either androgynous (ungendered) or non-androgynous (gendered), indicating which parts of the system may mate together. Early systems for conjoining spacecraft were all non-androgynous docking system designs. Non-androgynous designs are a form of "gender mating" where each spacecraft to be joined has a unique design ("male" or "female") and a specific role to play in the docking process. The roles cannot be reversed. Furthermore, two spacecraft of the same gender cannot be joined at all. Androgynous docking (and later androgynous berthing) by contrast has an identical interface on both spacecraft. In an androgynous interface, there is a single design which can connect to a duplicate of itself. This allows system-level redundancy (role reversing) as well as rescue and collaboration between any two spacecraft. It also provides more flexible mission design and reduces unique mission analysis and training. Original Russian probe and drogue docking system Docking No The original Soyuz "probe and drogue" docking system was used with the first generation Soyuz 7K-OK spacecraft from 1966 until 1970, in order to gather engineering data as a preparation for the Soviet space station program. The gathered data were subsequently used for the conversion of the Soyuz spacecraft – which was initially developed for the Soviet manned lunar program – into a space station transport craft. A first docking with two uncrewed Soyuz spacecraft – the first fully automated space docking in the history of space flight – was made with the Kosmos 186 and Kosmos 188 missions on October 30, 1967. SSVP-G4000 Docking Yes SSVP-G4000 is also known more vaguely as the Russian "probe and drogue" or simply the "Russian Docking System" (RDS). In Russian, SSVP stands for Sistema Stykovki i Vnutrennego Perekhoda, literally "System for docking and internal transfer". It was used for the first docking to a space station in the history of space flight, with the Soyuz 10 and Soyuz 11 missions that docked to the Soviet space station Salyut 1 in 1971. The docking system was upgraded in the mid-1980s to allow the docking of 20 ton modules to the Mir space station. It has a circular transfer passage that has a diameter of 800 mm (31 in) and is manufactured by RKK Energiya. The "probe and drogue" system allows visiting spacecraft using the "probe" docking interface, such as Soyuz, Progress and ESA’s ATV spacecraft, to dock to space stations that offer a port with a "drogue" interface, like the former Salyut and Mir or the current ISS space station. There are a total of four such docking ports available on the Russian Orbital Segment of ISS for visiting spacecraft; These are located on the Zvezda, Rassvet, Pirs and Poisk modules. Furthermore, the "probe and drogue" system was used on the ISS to dock Rassvet semipermanently to Zarya. SSVP-M8000 (Hybrid Docking System) Docking Yes SSVP-M8000 or more commonly known as "hybrid", is a combination of a "probe and drogue" soft-dock mechanism with an APAS-95 hard-dock collar. It began to be manufactured in 1996. It is manufactured by RKK Energiya. Chinese Docking Mechanism Docking Yes Used by Shenzhou spacecraft, beginning with Shenzhou 8, to dock to Chinese space stations. The Chinese docking mechanism is based on the Russian APAS-89/APAS-95 system; some have called it a "clone". There have been contradicting reports by the Chinese on its compatibility with APAS-89/95. It has a circular transfer passage that has a diameter of 800 mm (31 in). The androgynous variant has a mass of 310 kg and the non-androgynous variant has a mass of 200 kg. Used for the first time on Tiangong 1 space station and will be used on future Chinese space stations and with future Chinese cargo resupply vehicles. International Berthing and Docking Mechanism Docking or Berthing Yes The European mating system is planned to be capable of docking and berthing large and small spacecraft. The IBDM is designed to be compliant with the International Docking System Standard (IDSS) and is hence compatible with the future ISS International Docking Adapter (IDA) on the US side of the ISS. It has a circular transfer passage that has a diameter of 800 mm (31 in). The American company Sierra Nevada Corporation (SNC) is developing the Dream Chaser, which is a small reusable spacecraft that is a candidate to transport astronauts and/or crew to the ISS. The European Space Agency has started a cooperation with SNC to potentially provide the IBDM for attaching this new vehicle to the ISS in the future. ASTP Docking Module: An airlock module that converted U.S. Probe and Drogue to APAS-75. Built by Rockwell International for the 1975 Apollo–Soyuz Test Project mission. Pressurized Mating Adapter (PMA): Converts an active Common Berthing Mechanism to APAS-95. Three PMAs are attached to the ISS, PMA-1 and PMA-2 were launched in 1998 on STS-88, PMA-3 in late 2000 on STS-92. PMA-1 is used to connect the Zarya control module with Unity node 1, Space Shuttles used PMA-2 and PMA-3 for docking. International Docking Adapter (IDA): Converts APAS-95 to the NASA Docking System (NDS). An IDA will be placed on each of the ISS' two open PMAs, both of which will be located on Node-2 (Harmony module). IDA-1 was planned to be launched on SpX CRS-7 until its launch failure, and attached to Node-2's forward PMA. IDA-2 was launched on SpX CRS-9 and attached to Node-2's forward PMA. IDA-3, the replacement for IDA-1, will launch on SpX CRS-18 and attach to Node-2’s zenith PMA. The adapter will be compatible with the International Docking System Standard (IDSS), which is an attempt by the ISS Multilateral Coordination Board to create a docking standard. The Soft-Capture Mechanism (SCM) added in 2009 to the Hubble Space Telescope. The SCM allows both manned and uncrewed spacecraft that utilize the NASA Docking System (NDS) to dock with Hubble. For the first fifty years of spaceflight, the main objective of most docking and berthing missions was to transfer crew, construct or resupply a space station, or to test for such a mission (e.g. the docking between Kosmos 186 and Kosmos 188). Therefore, commonly at least one of the participating spacecraft was "manned", with a pressurized habitable volume (e.g. a space station or a lunar lander) being the target – the exceptions were a few fully uncrewed Soviet docking missions (e.g. the dockings of Kosmos 1443 and Progress 23 to an uncrewed Salyut 7 or Progress M1-5 to an uncrewed Mir). Another exception were a few missions of the manned US Space Shuttles, like berthings of the Hubble Space Telescope (HST) during the five HST servicing missions. Changes to the "manned" aspect began in 2015, as a number of economically driven commercial dockings of uncrewed spacecraft were planned. In 2011, two commercial spacecraft providers[which?] announced plans to provide autonomous/teleoperated uncrewed resupply spacecraft for servicing other uncrewed spacecraft. Notably, both of these servicing spacecraft were intending to dock with satellites that weren't designed for docking, nor for in-space servicing. The early business model for these services was primarily in near-geosynchronous orbit, although large delta-v orbital maneuvering services were also envisioned. Building off of the 2007 Orbital Express mission — a U.S. government-sponsored mission to test in-space satellite servicing with two vehicles designed from the ground up for on-orbit refueling and subsystem replacement — two companies announced plans for commercial satellite servicing missions that would require docking of two uncrewed vehicles. Space Infrastructure Servicing (SIS) is a spacecraft that was being developed by Canadian aerospace firm MacDonald, Dettwiler and Associates (MDA)—maker of Canadarm—to operate as a small-scale in-space refueling depot for communication satellites in geosynchronous orbit. Intelsat was a requirements and funding partner for the initial demonstration satellite, intended for launch in 2015. Mission Extension Vehicle (MEV) was a spacecraft being developed in 2011 by the U.S. firm ViviSat, a 50/50 joint venture of aerospace firms U.S. Space and ATK, to operate as a small-scale in-space satellite-refueling spacecraft. MEV would dock but would not transfer fuel. Rather it would use "its own thrusters to supply attitude control for the target." The SIS and MEV vehicles each planned to use a different docking technique. SIS planned to utilize a ring attachment around the kick motor while the Mission Extension Vehicle would use a somewhat more standard insert-a-probe-into-the-nozzle-of-the-kick-motor approach. A prominent spacecraft that received a mechanism for uncrewed dockings is the Hubble Space Telescope (HST). In 2009 the STS-125 shuttle mission added the Soft-Capture Mechanism (SCM) at the aft bulkhead of the space telescope. The SCM is meant for unpressurized dockings and will be used at the end of Hubble's service lifetime to dock an uncrewed spacecraft to de-orbit Hubble. The SCM used was designed to be compatible to the NASA Docking System (NDS) interface to reserve the possibility of a Multi-Purpose Crew Vehicle docked mission. The SCM will, compared to the system used during the five HST Servicing Missions to capture and berth the HST to the Space Shuttle, significantly reduce the rendezvous and capture design complexities associated with such missions. The NDS bears some resemblance to the APAS-95 mechanism, but is not compatible with it. Docking with a spacecraft (or other man made space object) that does not have an operable attitude control system might sometimes be desirable, either in order to salvage it, or to initiate a controlled de-orbit. Some theoretical techniques for docking with non-cooperative spacecraft have been proposed so far. Yet, with the sole exception of the Soyuz T-13 mission to salvage the crippled Salyut 7 space station, as of 2006[update], all spacecraft dockings in the first fifty years of spaceflight had been accomplished with vehicles where both spacecraft involved were under either piloted, autonomous or telerobotic attitude control. 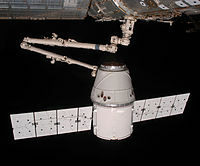 In 2007, however, a demonstration mission was flown that included an initial test of a non-cooperative spacecraft captured by a controlled spacecraft with the use of a robotic arm. Research and modeling work continues to support additional autonomous noncooperative capture missions in the coming years. Salyut 7, the tenth space station of any kind launched, and Soyuz T-13 were docked in what author David S. F. Portree describes as "one of the most impressive feats of in-space repairs in history". Solar tracking failed and due to a telemetry fault the station did not report the failure to mission control while flying autonomously. Once the station ran out of electrical energy reserves it ceased communication abruptly in February 1985. Crew scheduling was interrupted to allow Russian military commander Vladimir Dzhanibekov and technical science flight engineer Viktor Savinykh to make emergency repairs. All Soviet and Russian space stations were equipped with automatic rendezvous and docking systems, from the first space station Salyut 1 using the IGLA system, to the Russian Orbital Segment of the International Space Station using the Kurs system. The soyuz crew found the station was not broadcasting radar or telemetry for rendezvous, and after arrival and external inspection of the tumbling station, the crew judged proximity using handheld laser rangefinders. Dzhanibekov piloted his ship to intercept the forward port of Salyut 7, matched the station's rotation and achieved soft dock with the station. After achieving hard dock they confirmed that the station's electrical system was dead. Prior to opening the hatch, Dzhanibekov and Savinykh sampled the condition of the station's atmosphere and found it satisfactory. Attired in winter fur-lined clothing, they entered the cold station to conduct repairs. Within a week sufficient systems were brought back online to allow robot cargo ships to dock with the station. Nearly two months went by before atmospheric conditions on the space station were normalized. Orbital Express: ASTRO (left) and NEXTSat (right), 2007. Non-cooperative rendezvous and capture techniques have been theorized, and one mission has successfully been performed with uncrewed spacecraft in orbit. A typical approach for solving this problem involves two phases. First, attitude and orbital changes are made to the "chaser" spacecraft until it has zero relative motion with the "target" spacecraft. Second, docking maneuvers commence that are similar to traditional cooperative spacecraft docking. A standardized docking interface on each spacecraft is assumed. NASA has identified automated and autonomous rendezvous and docking — the ability of two spacecraft to rendezvous and dock "operating independently from human controllers and without other back-up, [and which requires technology] advances in sensors, software, and realtime on-orbit positioning and flight control, among other challenges" — as a critical technology to the "ultimate success of capabilities such as in-orbit propellant storage and refueling," and also for complex operations in assembling mission components for interplanetary destinations. The Automated/Autonomous Rendezvous & Docking Vehicle (ARDV) is a proposed NASA Flagship Technology Demonstration (FTD) mission, for flight as early as 2014/2015. An important NASA objective on the proposed mission is to advance the technology and demonstrate automated rendezvous and docking. One mission element defined in the 2010 analysis was the development of a laser proximity operations sensor that could be used for non-cooperative vehicles at distances between 1 metre (3 ft 3 in) and 3 kilometers (2 mi). Non-cooperative docking mechanisms were identified as critical mission elements to the success of such autonomous missions. Grappling and connecting to non-cooperative space objects was identified as a top technical challenge in the 2010 NASA Robotics, tele-robotics and autonomous systems roadmap. Docking and undocking describe spacecraft using a docking port, without assistance and under their own power. Berthing takes place when a spacecraft or unpowered module cannot use a docking port or requires assistance to use one. This assistance may come from a spacecraft, such as when the Space Shuttle used its robotic arm to push ISS modules into their permanent berths. In a similar fashion the Poisk module was permanently berthed to a docking port after it was pushed into place by a modified Progress spacecraft which was then discarded. The Cygnus resupply spacecraft arriving at the ISS does not connect to a docking port, instead it is pulled into a berthing mechanism by the station's robotic arm and the station then closes the connection. The berthing mechanism is used only on the US segment of the ISS, the Russian segment of the ISS uses docking ports for permanent berths. Docking has been discussed by NASA in regards to a Crewed Mars rover, such as with Mars habitat or ascent stage. ^ a b c d e f g h i j k l John Cook; Valery Aksamentov; Thomas Hoffman; Wes Bruner (1 Jan 2011). "ISS Interface Mechanisms and their Heritage" (PDF). Houstan, Texas: Boeing. Retrieved 31 March 2015. Docking is when one incoming spacecraft rendezvous with another spacecraft and flies a controlled collision trajectory in such a manner so as to align and mesh the interface mechanisms. The spacecraft docking mechanisms typically enter what is called soft capture, followed by a load attenuation phase, and then the hard docked position which establishes an air-tight structural connection between spacecraft. Berthing, by contrast, is when an incoming spacecraft is grappled by a robotic arm and its interface mechanism is placed in close proximity of the stationary interface mechanism. Then typically there is a capture process, coarse alignment and fine alignment and then structural attachment. ^ a b c d e Fehse, Wigbert (2003). Automated Rendezvous and Docking of Spacecraft. Cambridge, UK: Cambridge University Press. ISBN 978-0521824927. ^ a b c d e f "Advanced Docking/Berthing System – NASA Seal Workshop" (PDF). NASA. 2004-11-04. p. 15. Archived from the original (PDF) on September 22, 2011. Retrieved 2011-03-04. Berthing refers to mating operations where an inactive module/vehicle is placed into the mating interface using a Remote Manipulator System-RMS. Docking refers to mating operations where an active vehicle flies into the mating interface under its own power. ^ a b "Mir Hardware Heritage Part 1: Soyuz" (PDF). NASA. p. 10. Archived from the original (PDF) on 26 December 2017. Retrieved 3 October 2018. ^ "History". Archived from the original on April 24, 2008. Retrieved June 23, 2010. ^ "Apllo 9 Press Kit" (PDF). NASA. 23 Feb 1969. p. 43. Retrieved 17 March 2015. The tunnel is 32 inches (.81 cm) in diameter and is used for crew transfer between the CSM and LM by crewmen in either pressurized or unpressurized extravehicular mobility units (EMU). ^ Harland, David (2011). Apollo 12 – On the Ocean of Storms: On the Ocean of Storms. New York: Springer. p. 138. ^ a b c d e Portree, David (March 1995). "Mir Hardware Heritage" (PDF). NASA. Archived from the original (PDF) on 3 August 2009. Retrieved 11 December 2011. ^ a b c d e f g "Docking Systems". RussianSpaceWeb.com. Retrieved 2 September 2012. ^ a b c d e Bart Hendrickx; Bert Vis (2007). Energiya-Buran: The Soviet Space Shuttle. Chichester, UK: Praxis Publishing Ltd. pp. 379–381. ISBN 978-0-387-69848-9. For space station missions Buran would have carried a Docking Module (SM) in the forward part of the payload bay. It consisted of a spherical section (2.55 m in diameter) topped with a cylindrical tunnel (2.2 m in diameter) with an APAS-89 androgynous docking port, a modified version of the APAS-75 system developed by NPO Energiya for the 1975 Apollo-Soyuz Test Project (Page 141). The plan was for the orbiter to be launched uncrewed and fly to the Mir space station, where it would dock with the axial APAS-89 docking port of the Kristall module (Page 246). In the late 1980s NPO Energiya was ordered to build three Soyuz spacecraft (serial numbers 101, 102, 103) with APAS-89 docking ports (Page 246). Soyuz craft nr. 101 was eventually launched as Soyuz TM-16 on January 1993, carrying another resident crew (Gennadiy Manakov and Aleksandr Poleshchuk) to Mir space station. Equipped with an APAS-89 docking port, it was the only Soyuz vehicle to ever docking with the Kristall module. Soyuz "rescue" vehicle nr. 102 and 103, which had only been partially assembled, were modified as ordinary Soyuz TM spacecraft with standard "probe" docking mechanisms and were given new serial numbers (Page 249). In July 1992 NASA initiated the development of the Orbiter Docking System (ODS) to support Shuttle flights to Mir. Mounted in the forward end of the payload bay, the ODS consists of an external airlock, a supporting truss structure, and an APAS docking port. While the first two elements were built by Rockwell, the APAS was manufactured by RKK Energiya. Although Energiya's internal designator for the Shuttle APAS is APAS-95, it is essentially the same as Buran's APAS-89. While the ODS was slightly modified for Shuttle missions to ISS, APAS remained unchanged (Page 380). ^ "Kristall module (77KST) at a glance". ^ Tests of new Dragon systems to begin minutes after launch, Stephen Clark, Spaceflight Now, 2012-05-21, accessed 2012-050-22. ^ "Cygnus Pressurized Cargo Module Completes Proof-Pressure Testing". Orbital Sciences. August 2010. Archived from the original on April 17, 2013. Retrieved 16 March 2015. The PCM hatch has a strong resemblance to the current hatches used on the US-segment of the ISS. However, at 37 inches on each side, it is somewhat smaller than the 50 inch ISS hatch. ^ "China's First Space Station Module Readies for Liftoff". Space News. 1 August 2012. Retrieved 3 September 2012. ^ "Differences between Shenzhou-8 and Shenzhou-7". CCTV. 31 October 2011. Retrieved 17 March 2015. there will be an 800-millimetre cylindrical passage connecting Shenzhou-8 and Tiangong-1. ^ Qiu Huayon; Liu Zhi; Shi Junwei; Zheng Yunqing (August 2015). "Birth of the Chinese Docking System". Go Taikonauts! Issue 16. p. 12. ^ a b c International Docking System Standard (PDF) (Rev. C ed.). November 20, 2013. Archived from the original (PDF) on December 16, 2013. ^ "Status of Human Exploration and Operations Mission Directorate (HEO)" (PDF). NASA. 2013-07-29. Retrieved 2014-03-19. ^ "QinetiQ Space Wins ESA Contract for International Berthing Docking Mechanism". Space Ref Business. ^ "Apollo ASTP Docking Module". Astronautix. Retrieved 7 April 2018. ^ a b c Hartman, Dan (23 July 2012). "International Space Station Program Status" (PDF). NASA. Retrieved 10 August 2012. ^ Lupo, Chris (2010-06-14). "NDS Configuration and RequirementsChanges since Nov 2010" (PDF). NASA. Archived from the original (PDF) on 14 August 2011. Retrieved 22 August 2011. ^ a b Hartman, Daniel (July 2014). "Status of the ISS USOS" (PDF). NASA Advisory Council HEOMD Committee. Retrieved 26 October 2014. ^ Pietrobon, Steven (August 20, 2018). "United States Commercial ELV Launch Manifest". Retrieved August 21, 2018. ^ Bayt, Rob (2011-07-26). "Commercial Crew Program: Key Drving Requirements Walkthrough". NASA. Archived from the original on 28 March 2012. Retrieved 27 July 2011. ^ a b c d Morring, Frank, Jr. (2011-03-22). "An End To Space Trash?". Aviation Week. Retrieved 2011-03-21. ViviSat, a new 50-50 joint venture of U.S. Space and ATK, is marketing a satellite-refueling spacecraft that connects to a target spacecraft using the same probe-in-the-kick-motor approach as MDA, but does not transfer its fuel. Instead, the vehicle becomes a new fuel tank, using its own thrusters to supply attitude control for the target. ... [the ViviSat] concept is not as far along as MDA. ... In addition to extending the life of an out-of-fuel satellite, the company could also rescue fueled spacecraft like AEHF-1 by docking with it in its low orbit, using its own motor and fuel to place it in the right orbit, and then moving to another target. ^ "Intelsat Picks MacDonald, Dettwiler and Associates Ltd. for Satellite Servicing". press release. CNW Group. Retrieved 2011-03-15. MDA planned to launch its Space Infrastructure Servicing ("SIS") vehicle into near geosynchronous orbit, where it would service commercial and government satellites in need of additional fuel, re-positioning or other maintenance. The first refueling mission was to be available 3.5 years following the commencement of the build phase. ... The services provided by MDA to Intelsat under this agreement are valued at more than US$280 million. ^ de Selding, Peter B. (2011-03-14). "Intelsat Signs Up for Satellite Refueling Service". Space News. Retrieved 2011-03-15. if the MDA spacecraft performed as planned, Intelsat would pay a total of some $200 million to MDA. This assumed that four or five satellites would be given around 200 kilograms each of fuel. ^ "ViviSat Corporate Overview". company website. ViviSat. Retrieved 2011-03-28. ^ de Selding, Peter B. (2011-03-18). "Intelsat Signs Up for MDA's Satellite Refueling Service". Space News. Archived from the original on 2012-03-21. Retrieved 2011-03-20. more than 40 different types of fueling systems ... SIS will be carrying enough tools to open 75 percent of the fueling systems aboard satellites now in geostationary orbit. ... MDA will launch the SIS servicer, which will rendezvous and dock with the Intelsat satellite, attaching itself to the ring around the satellite’s apogee-boost motor. With ground teams governing the movements, the SIS robotic arm will reach through the nozzle of the apogee motor to find and unscrew the satellite’s fuel cap. The SIS vehicle will reclose the fuel cap after delivering the agreed amount of propellant and then head to its next mission. ... Key to the business model is MDA’s ability to launch replacement fuel canisters that would be grappled by SIS and used to refuel dozens of satellites over a period of years. These canisters would be much lighter than the SIS vehicle and thus much less expensive to launch. ^ NASA (2008). "The Soft Capture and Rendezvous System". NASA. Retrieved May 22, 2009. ^ Parma, George (2011-05-20). "Overview of the NASA Docking System and the International Docking System Standard" (PDF). NASA. Archived from the original (PDF) on 15 October 2011. Retrieved 11 April 2012. ^ a b Ma, Zhanhua; Ma, Ou & Shashikanth, Banavara (October 2006). "Optimal Control for Spacecraft to Rendezvous with a Tumbling Satellite in a Close Range" (PDF). Proceedings of the 2006 IEEE/RSJ International Conference on Intelligent Robots and Systems: 4109–4114. Archived from the original (PDF) on 2013-06-05. Retrieved 2011-08-09. One of the most challenging tasks for satellite on-orbit servicing is to rendezvous and capture a non-cooperative satellite such as a tumbling satellite. ^ a b Clark, Stephen (2007-07-04). "In-space satellite servicing tests come to an end". Spaceflight Now. Retrieved 2014-03-20. ^ Xu, Wenfu (September 2010). "Autonomous rendezvous and robotic capturing of non-cooperative target in space". Robotica. 28 (5): 705–718. doi:10.1017/S0263574709990397. Retrieved 2014-11-16. ^ Yoshida, Kazuya (2004). "Dynamics, control and impedance matching for robotic capture of a non-cooperative satellite". Advanced Robotics. 18 (2): 175–198. doi:10.1163/156855304322758015. ^ "Dzhanibekov". Astronautix.com. Retrieved August 5, 2013. ^ "Savinykh". Astronautix.com. Retrieved August 5, 2013. ^ "Optimal Control of Rendezvous and Docking with a Non-Cooperative Satellite" (PDF). New Mexico State University. Archived from the original (PDF) on 2013-06-05. Retrieved 2011-07-09. Most of the current research and all the past missions are aiming at capturing very cooperative satellites only. In the future, we may also need to capture non-cooperative satellites such as the ones tumbling in space or not designed for being captured. ^ a b Tooley, Craig (2010-05-25). "A New Space Enterprise of Exploration" (PDF). NASA. Retrieved 2012-06-25. ^ Ambrose, Rob (November 2010). "Robotics, Tele-Robotics and Autonomous systems Roadmap (Draft)" (PDF). NASA. Retrieved 2012-06-25. A smaller common docking system for robotic spacecraft is also needed to enable robotic spacecraft AR&D within the capture envelopes of these systems. Assembly of the large vehicles and stages used for beyond LEO exploration missions will require new mechanisms with new capture envelopes beyond any docking system currently used or in development. Development and testing of autonomous robotic capture of non-cooperative target vehicles in which the target does not have capture aids such as grapple fixtures or docking mechanisms is needed to support satellite servicing/rescue.